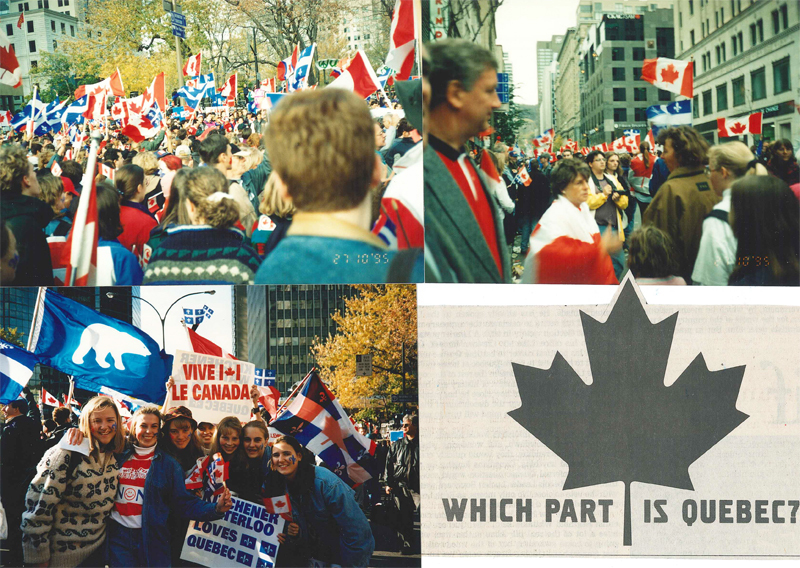 Autumn of 1995 was an uncertain time to be a Canadian. The Province of Québec was about to hold a referendum on whether to take steps towards independence from Canada. 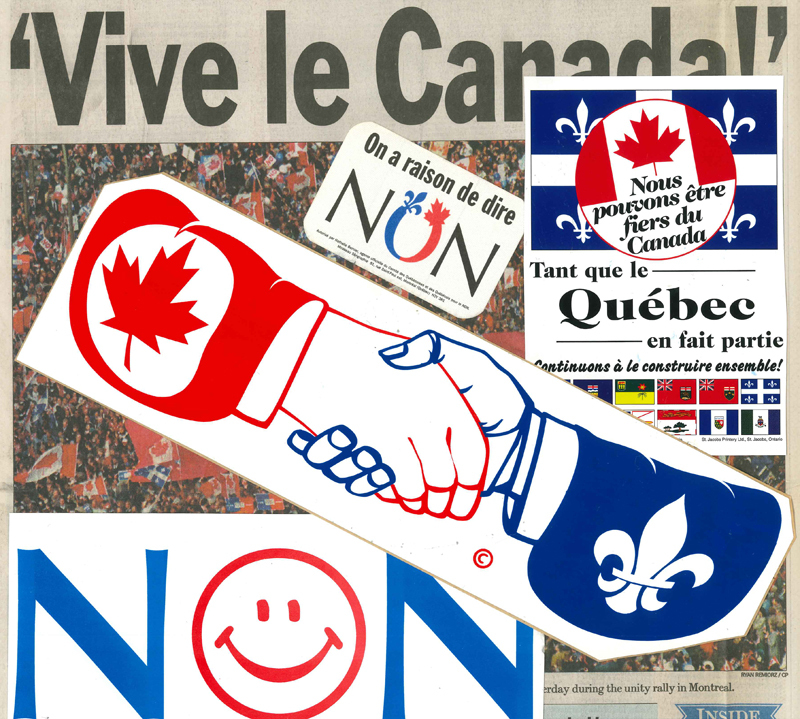 The referendum question was as follows: "Do you agree that Québec should become sovereign after having made a formal offer to Canada for a new economic and political partnership within the scope of the bill respecting the future of Quebec and of the agreement signed on June 12, 1995?" A vote of OUI/YES would be for sovereignty while NON/NO would be to remain as part of Canada. The vote was set for October 30th. As the date got closer, the opinion polls found the OUI and NON sides almost even. For many of us outside Québec, fear set in. Everything was uncertain. What happens if our country splits? So the NON side organized a rally in Montréal to take place three days before the vote. The idea was to show that the rest of Canada supports and needs Québec. My high school was offered transportation for interested students to join the rally. Immediately after the Halloween dance, a collection of Grade 12 and 13 students climbed into coaches that had been provided by the Liberal Party (which ended up being a bit of an issue...) We travelled through the night, eight hours, then we were disgorged into a chaotic downtown with our flags and banners. I've scanned some photos and ephemera from my high school scrapbook. In the centre photo above is the prime minister Jean Chrétien at the podium. I am not certain how it happened but the group from my high school ended up at the very front of the rally, in the first row of the crowd in front of the stage where the politicians gave their speeches. We later found ourselves in Macleans Magazine, on TV, even on the front page of the New York Times. The exact size of the crowd at the October 27th Unity Rally is unknown. Estimates range from 30,000 people to 150,000 people. Here's the NYT's take on the event: "what had started here as a grass-roots call to show solidarity with Quebecers mushroomed into an emotional national event, drawing people from as far away as the Yukon, many taking advantage of cut-rate "unity fares" offered by train, bus and airline companies. 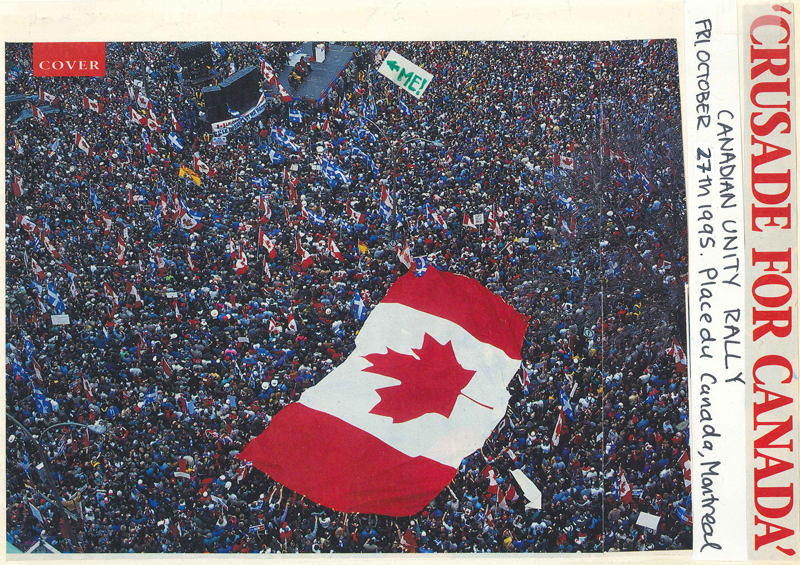 It was the biggest demonstration in recent years in the city that is Quebec's commercial capital". So tens of thousands of us hit Montréal as a love-bomb, asking Québec to please stay. To be honest, I don't know how many undecided voters would really have been convinced by our presence. The NON crowd completely took over le centre-ville, brandishing placards in mangled French. We were intrusive. There were arguments with OUI supporters and other kinds of disruptions. Still, we were there and we showed that the rest of Canada did care. In the end, the vote was one of the closest ever. A 93.52% voter turnout resulted in 49.42% for OUI/YES and 50.58% for NON/NO. Canada would remain united in 1995. As for my experience at the rally, it was a memorable day for me and it's cool to be able to say "I was there". The atmosphere that day is not something I can forget. I am actually not a patriotic person whatsoever but I did and still do care very much about Canada remaining a united country. As of 2015, the issue of Québec sovereignty is by no means resolved forever. In last week's federal election, the Bloc Québécois won ten seats, up from four in 2011 (in 1995, the party held 54 seats in the Canadian parliament). Party leader Duceppe re-stated the BQ's stance simply: "I think we're better off being a country in the world than a province in Canada". 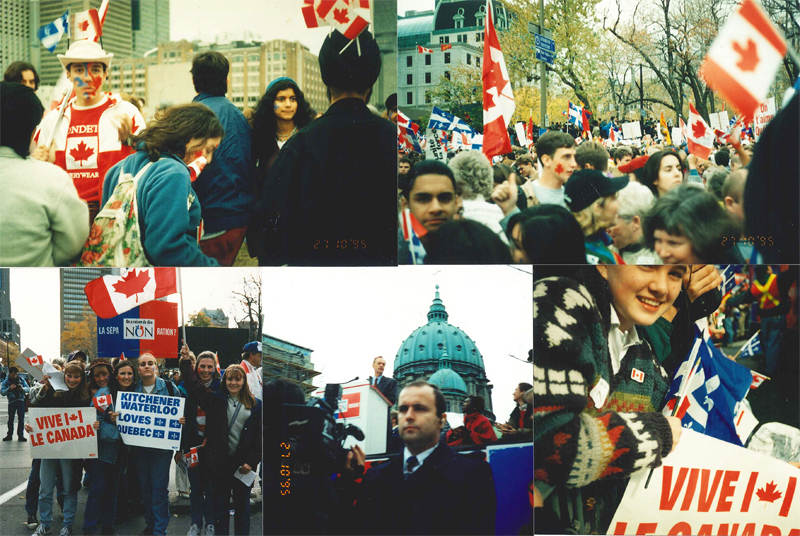 In 2005, the CBC put together a three hour documentary called Breaking Point/Point de Rupture about the 1995 Québec referendum. I found the French version on YouTube, Part 1 and Part 2. The portion specifically about the Unity Rally starts here. I also found... myself! Crushed at the front barrier, I was next to none other than "Hurricane Hazel" McCallion, a well-known Ontario politician. She ended up being plucked from the crowd by the security staff to join the other VIPs, but first we were captured in frame together.